August 2015 – My Story – ISB and beyond !!! 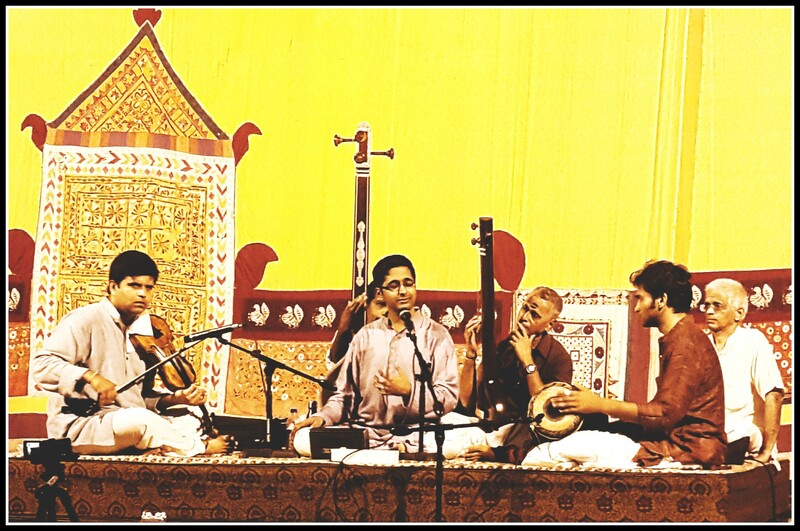 Here is part 5 of the series I am writing on the science behind music in “Saamagaana – The First Melody“, a monthly magazine on Indian Classical Music. The intent is to help readers understand a bit more about the science behind music and musical instruments and to enhance their appreciation of the same. Why are the walls of an auditorium usually panelled with cork-like material? Reflection of sound from the walls of an auditorium can cause echoes and undue prolongation of sound. One of the most effective ways to prevent this is by padding or panelling the walls of the auditorium with materials like cork. These absorb sound effectively and prevent echoes and unwanted reverberations. Why are loudspeakers placed on stage in concerts even though there is no audience on stage? The loudspeakers on stage, also known as stage monitors, are meant for the performing artistes. When a group of musicians perform on stage, especially on different instruments, it might be difficult for them to hear themselves distinctly from the other musicians around them. Hearing oneself clearly helps a musician feel the good music (s)he produces. Hearing co-artistes clearly gives comfort that the team is performing well as a whole. Stage monitors help achieve this and are thus supposed to help musicians give their best. I sometimes hear a howling sound coming from the audio system. What is this sound and how does it get produced when no one seems to be actually howling on stage? This is called feedback. It is caused when sound from a loudspeaker enters a microphone and gets amplified back to the loudspeaker again. It can occur, for example, if the monitors on stage are closer to the microphone and angled towards it. This creates a loop with amplification happening over and over and as a result, produces a howling sound. How can feedback be avoided? A few simple ways to avoid feedback are to position the loudspeakers as far away from the microphones as possible, to angle the speakers away from the microphones (and to angle the microphones away from the speakers), to place the microphones as close to the sources of music as possible and to keep the sound levels from the speaker to the lowest levels required. I have seen some musicians perform with a earpiece or even a pair of earpieces. What would they use them for? They could be using them to hear the pitch better. Or, most likely, they could be using them to hear the monitor mixes, instead of using loudspeakers on stage. With this kind of in-ear monitoring, the sound can go directly where it is needed, instead of getting spilled all over the stage from the stage monitors and sometimes even getting undesirably spilled into the audience area as well. One drawback of this, though, is that musicians with a pair of earpieces can get aurally disconnected from their surroundings and isolated from their audience. Madhuradhwani is organizing Kamba Ramayanam Isai Perurai by the living legend Padma Bhushan Sangita Kalanidhi Madurai Shri T.N. 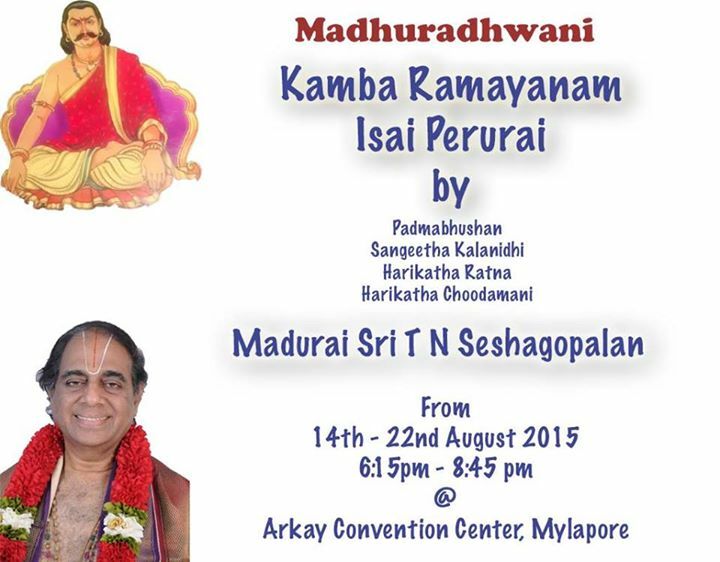 Seshagopalan from 14th to 22nd Aug at Arkay Convention Center, Mylapore. The program starts at 6PM everyday. Having heard Shri Seshagopalan’s discourses earlier on this as well as other topics, I would urge fellow rasikas to not miss this opportunity.